Many of us make the same resolution every year: Make healthier choices. Some of those choices might be based on exercising more or losing weight, which can sometimes be difficult to achieve, especially if they’re not specific. Hence the same resolution every year! Let’s give ourselves a break, shall we? The resolution to make healthier choices can be a lot more achievable when we specify the goal. How about eliminating toxins from your personal care and home routines? It’s a big deal goal, but it’s surprisingly easy to achieve. Did you know that there are toxic chemicals lurking in many personal care and home products? The average woman is exposed to hundreds of harmful ingredients before she even leaves the house each day. Things like formaldehyde, a cancer-causing chemical, phthalates, which is a known endocrine disruptor, and methylisothiazolinone, which has been linked to lung toxicity, allergic reactions and possibly neurotoxicity, can be found in facial cleaners, shampoos, makeup, household cleaners and more. Luckily, PUREhaven Essentials offers alternatives to these toxic-laden products. Our products are made with all-natural ingredients in our certified organic manufacturing facility. We take the utmost care in creating, packaging, testing, and distributing the safest products possible, with no “fragrance” or parabens; no synthetic dyes or petroleum by-products; no harmful chemicals and no animal testing; and all gluten free. Focus on making one specific healthier choice at a time to make the goal of eliminating toxins easier to achieve. Start by determining the parts of your personal care and home routines that you want to change, and tackle each, one at a time. 1. Use toxic-free personal care products. PUREhaven ESSENTIALS personal care products are made with nontoxic ingredients and developed for maximum benefits. For instance, our Cleanser and Moisturizer are made with rose water, known for its anti-aging, oil control, anti-inflammatory, and moisturizing properties. Rose water refreshes the skin, without leaving it feeling tight. It’s rich in antioxidants, which helps skin stay youthful and healthy. And our exclusive formulas are designed to repair and restore, using the perfect combination of natural ingredients. 2. Choose toxic-free makeup and stop stressing your skin. Environmental factors can wreak havoc your skin. Reduce the stress by applying toxic-free PUREhaven ESSENTIALS products, made without harmful ingredients, to enhance your beauty. Several of our makeup products are made with orange blossom flower water, which is nonirritating and packed with high-performance skin-protecting antioxidants, vitamins, minerals and essential oils. 3. Protect yourself and your loved ones by using toxic-free personal care and household cleaners. A study conducted at George Washington University shows that 45 toxic chemicals are found commonly in house dust, coming from everyday products like shampoo, cosmetics, baby products, stain-repellent treatments, and fragrances. Phthalates and phenols were among the most common ingredients found in dust samples. They’re associated with hormone disruption, which can cause reproductive problems, and behavioral and neurodevelopmental issues in children. PUREhaven ESSENTIALS Surface Cleaner and Master Blaster are among our top-sellers because they’re not only safe, but effective as well. Master Blaster is our super hero, with ingredients that include the same enzymes that the human digestive system uses to break down food particles. That’s how Master Blaster naturally breaks down any stains or spills without causing damage. 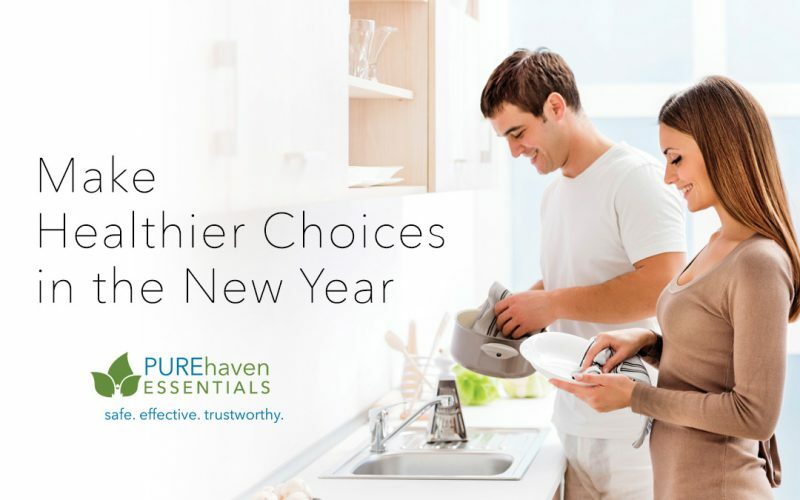 To learn more about our safe, effective, trustworthy ingredients, talk to your local Pure Haven Consultant or check out all our products, including ingredient lists, at www.purehaven.com/shop.